Few teachers are extraordinary, but Ms. Dallner is one of them. Ms. Dallner teaches in London, Ontario at University Heights Public School – a small school with a very big heart. Pound for pound, this school really fights above its weight class. In fact, it lays claim to being Canada’s very first “Compassionate School“. The school’s principal – Mr. Joe Shiek, is a social justice advocate and global head of the “Time Project” – a social justice platform that invites all schools around the world to unite together as one to engage students in intercultural dialogue about human rights and social justice topics. The school is also academically strong; it consistently ranks as one of the best in Canada. But today what impressed me most was Ms. Dallner’s letters. My niece is in Ms. Dallner’s grade 1 class and so it happened that Ms. Dallner became aware of my upcoming work with school children in Zambia. Through my sister, I shared some information with Ms. Dallner about the school in Katuba, Zambia (see previous post). I shared with her about how the grade 1 class in Katuba boasts 100 students and about how different the learning environment is for students there. What she did next is what only extraordinary teachers do – she had students individually compose and illustrate ONE HUNDRED letters for their unseen, unknown friends in Zambia. I’m blown away. 100 letters. One HUNDRED. Last week my niece was working on an assigned project for “Hundreds Day” at school (I subsequently learned that “Hundreds Day” marked the 100th day of school with fun activities, games and projects). In order to gain perspective on the actual number 100, she created a picture with 10 groups of 10 different coloured goldfish on it. One Hundred goldfish is a lot of goldfish in one picture. But one hundred personalized and illustrated letters? That’s special – very special. The letters are endearing and incredibly human. They talk about the cold winter in Canada. One letter explains how to build a snowman. It takes three snowballs – one large, one medium and one small and you stick the balls together. 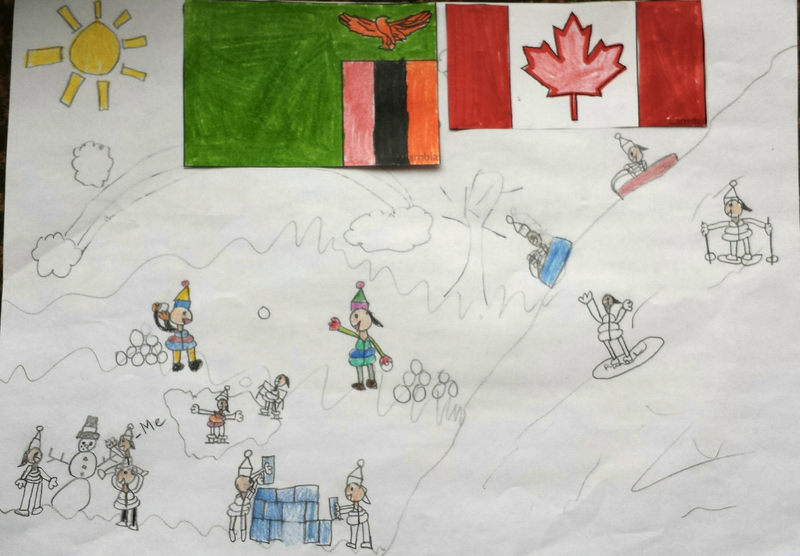 The kids tell their Zambian colleagues about snowflakes falling from the sky and how much fun it is to play in the snow and sled down snow hills. They ask questions and then they talk about the fun snowball fights. They mention how much they like to eat pizza and make snow angels and skate on the ice. They describe snow as fluffy cold stuff that you have ‘lots of fun in’. They explain how you need to wear a coat, snow pants and boots along with hats and mits to go outside. They mention the Chinese New Year, assemblies in the gym, the four seasons, singing in the music room, animals and their brothers and sisters. They mention where they are from: Canada, India, China, Egypt, Russia, Albania, Sri Lanka, Libya and Pakistan. The letters are a precious present. They are a very real gift from real little people playing in the cold Canadian snow to their little Zambian friends in warm wet Africa. Looking to children may be one of the surest ways for us to learn how to grow more human. Looking to teachers like Ms. Dallner is also highly recommended.